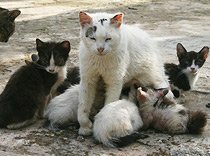 The information given below will help you to deal with various situations with the strays but it is VITALLY IMPORTANT that you deal with things whilst you are there. DON’T leave it until the day before you are leaving or when you get home. Positive results take time and effort on everyone’s part. Every year we receive numerous calls from tourists whose visit to Greece has resulted in their witnessing animal abuse and many say that their holiday was ruined and that they will never return. Most enquiries are about abandoned kittens and pups that are found discarded on the road or in bins, sadly, this is common practice. 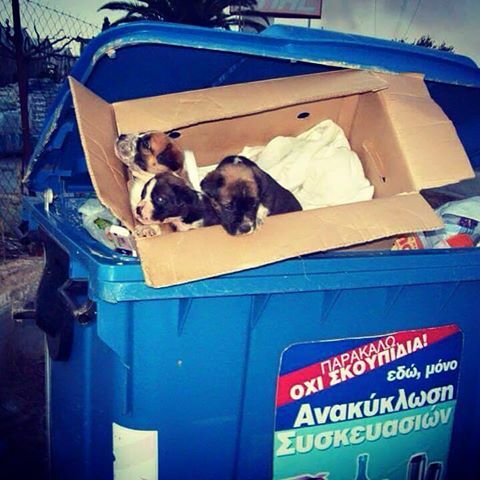 The standards of animal welfare in Greece bear no comparison whatsoever to those in the UK and there are no recognised organisations to help as the strays are ‘officially’, the responsibility of the local councils but they show very little interest in the plight of the cats and dogs. 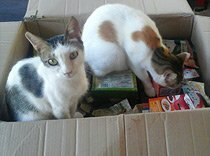 Fortunately, there are small pockets of people who do their best to help the strays but, like us, they are all volunteers and usually overwhelmed by the enormity of the situation. Hence, many are reluctant to take on any more animals as they simple can’t cope physically or financially. Therefore, it is up to everyone to do the best they can and to accept a degree of responsibility for these poor animals PLEASE DON’T IGNORE THEM or expect everyone else to take them on. If you find an animal that is injured or poisoned then enquire locally to find a vet and, if safe to do so, take the animal for treatment. Try to find a local group to give you advice, your hotel should know of possibilities. If you find animals that are chained, starved and/or beaten, this is against the law and it is helpful to obtain photographic evidence and GO TO THE POLICE. Don’t expect everyone else to do something because nothing will happen. Always be polite but firm and even offer to take the officer to see the animal. The police are required, by law, to investigate and respond in writing so be insistent as they are often reluctant to act. Some tourists find a dog and want to take it home. If you are tempted, then please THINK IT THROUGH CAREFULLY. 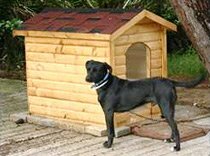 This can sound a good idea at the time but, once the dog arrives in the UK, some people change their minds and expect help to find it another home. However, if you are very serious about the decision to adopt the stray, then go to the DEFRA website where the pet passport procedure is fully explained. 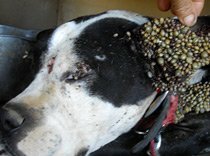 We are happy to help with advice regarding transport and we very strongly suggest that you have the dog tested for parasitic diseases such as Leishmaniasis. Adopting a stray is a hugely rewarding experience as long as you can offer a loving and understanding home. You can also complete and send the complaints form below to the contact address on the form. Together we can try to make a difference and get our voices heard.